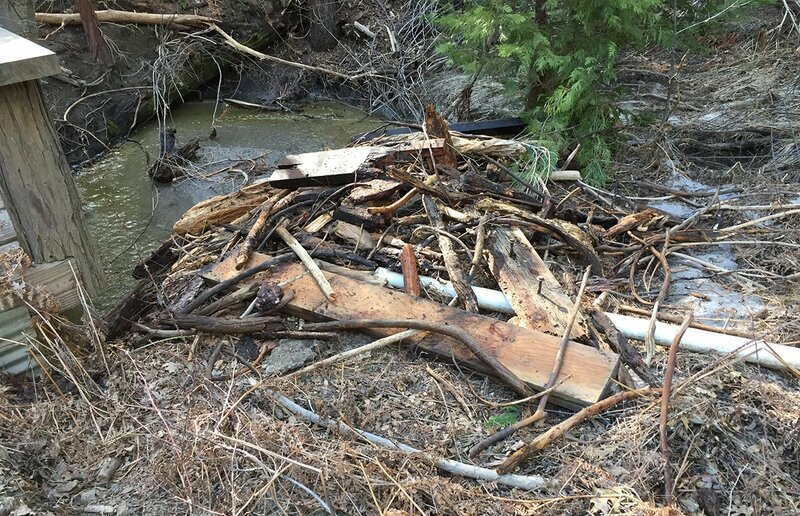 Extreme weather has left its mark on the NRS's James San Jacinto Mountains Reserve, as well as Idyllwild and several other Riverside County communities in the foothills of the San Jacinto Mountains. First came the 13,000-acre Cranston Fire in July 2018, which forced James staff to temporarily evacuate. Then came winter, which delivered record rain, snow, and floods. With 21.49 inches of precipitation, February 2019 is the second wettest month recorded since 1944, nearly meeting the record set in January 1993 (23.72 inches). Considering that the annual average precipitation for the same 75-year period is 24.1 inches, the magnitude of this event becomes strikingly evident. The rate of the rainfall was also remarkable. Nearly 7.5 inches fell at the James Reserve between the night of February 13 and the afternoon of February 14 in less than 24 hours. February 14 set a new daily high record of any season with 6.75 inches. Andrea Campanella inspecting flood damage to the bridge leading to the James Reserve's Trailfinders Lodge. Image credit: Lisa Schauer. While the water is beneficial for the forest and will produce rare and colorful flowers in the surrounding desert, it also triggered a cascade of events that severely isolated the James Reserve. The intensity of the rainfall quickly thawed the abundant snow covering higher elevation slopes. The oversaturated soils descended in mudslides, rockslides, and raging waters. 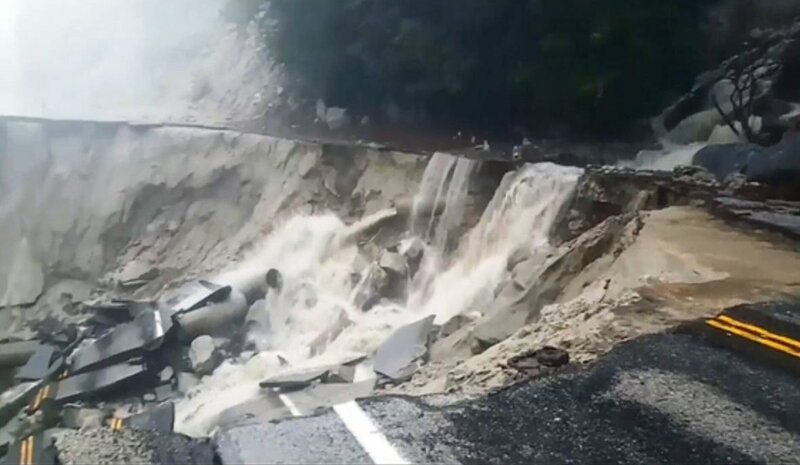 State Routes 243 and 74 washed away in several spots. SR243 collapsed about four miles north and south of the James, rendering it inaccessible to vehicles. As a result, the reserve will remain closed until at least mid-May, when Caltrans estimates it can repair the highway. On February 15, 2019, the California Highway Patrol escorted Assistant Reserve Director Andrea Campanella to the reserve to help Reserve Director Jennifer Gee and her dog Dexter evacuate. The following day, we both returned to the James for 15 frantic minutes to rescue Jen's cat Bug, ensure all was in order, and close the reserve. As soon as we returned from the reserve, Caltrans closed the road to traffic by installing huge rails blocking traffic. Then yet another storm front dumped more snow on the area. 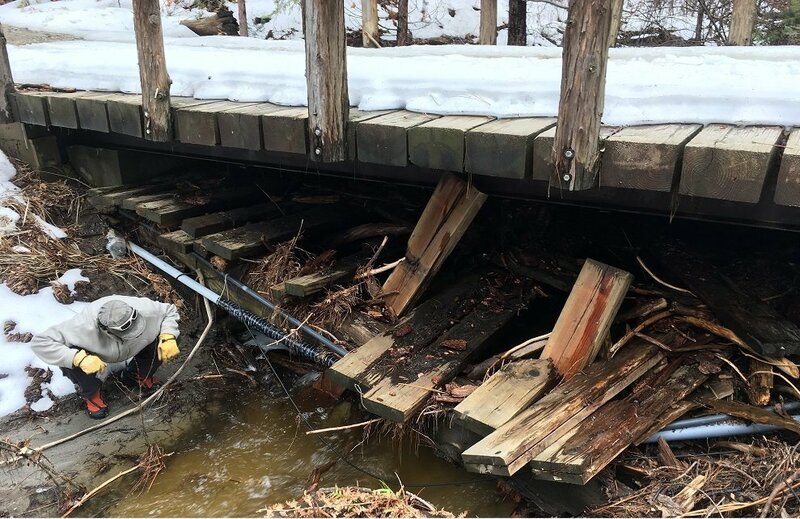 On March 3, Andrea was able to hike in to the James to perform required maintenance on the solar power equipment and to evaluate damage from the storms. 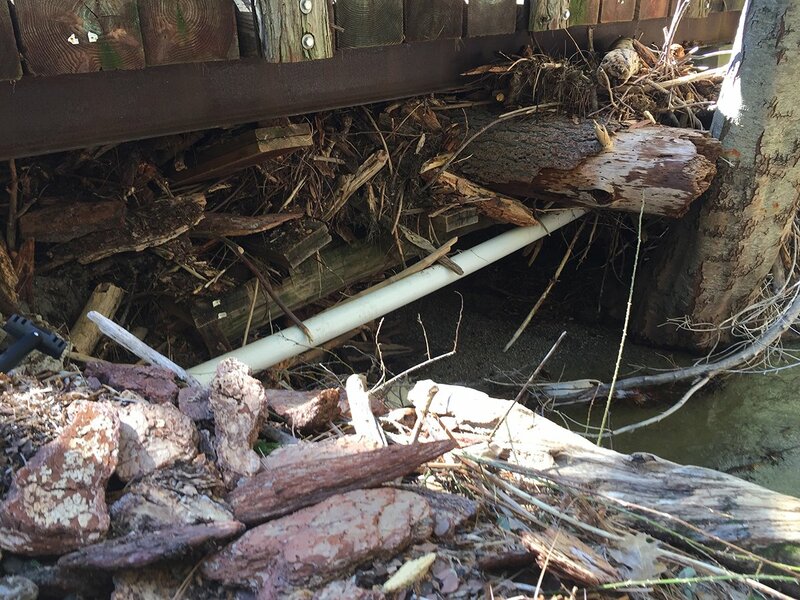 Major maintenance work will be needed to restore our water supply system, as debris has severely damaged the bridge to the reserve and some pipes. That said, the forest is looking green and healthy as a result of the massive doses of moisture. The past few months (and probably the next few months to come) have taken a substantial financial, emotional, and functional toll on the James Reserve, its staff, and users. While conditions have been unusually difficult, we feel extremely lucky and grateful for receiving the support of the University of California Natural Reserve System family. As was the case during our evacuation for the Cranston Fire last summer, we receive an incredible amount of emotional support from staff across all the reserves and at UC Riverside. We are constantly in contact with the NRS Director and staff at UCR, who are helping us solve associated problems including, but not limited to, searching for alternative housing, providing support to work remotely, and ensuring our salaries. Reserve staff will remain available by email, but are unable to respond to telephone messages as they do not have access to their offices. You can donate to the James Reserve online.